Demonstrate magnetic fields in an incredible way! 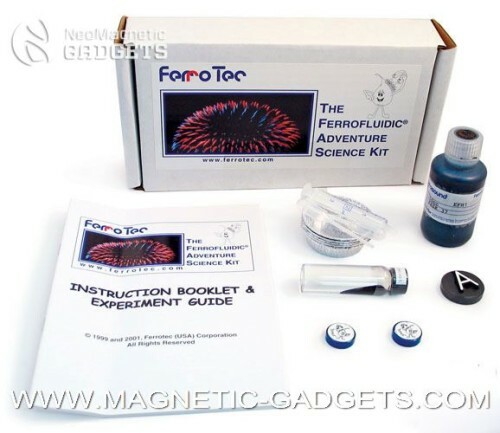 The Ferrofluidic Adventure Science Kit contains everything necessary (including magnets and a 17 page instruction booklet) to conduct fascinating experiments with Ferrofluid. Ferrofluid is dark oily magnetic material with amazing properties. When an external magnetic field is applied to the magnetic particles in the Ferrofluid they orient themselves almost instantly. This creates amazing spiky fractals and geometric forms that allow you to see the magnetic fields in 3 dimensions. When the magnet is removed, the Ferrofluid particles go back to their normal alignment very quickly. Ferrofluid is the only known material in which magnetism and fluidity coexist, we're sure this new kit will totally amaze you! This Ferrofluid is intended as a teaching tool or for amusement only, it should not be used in delicate loudspeaker applications.